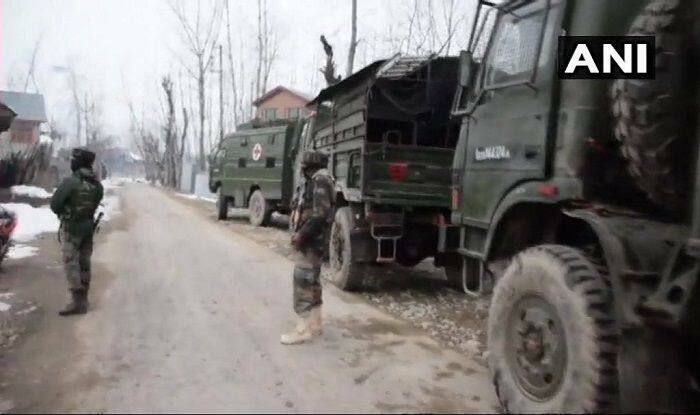 On February 10, five terrorists were killed in an encounter with security forces in Kulgam. New Delhi: An Army jawan lost his life and another was injured in an encounter between terrorists and security forces in Ratnipora area of Pulwama district in Jammu and Kashmir, news agency ANI reported on Tuesday. The exchange of fire is underway presently. One terrorist was also neutralised. A case has been registered and further investigation underway. The gunfight started after the security forces received inputs about the presence of militants, following which they launched a search and cordon operation. Security forces have cordoned off the area. Internet services have also been suspended. Locals pelted stones on the security forces during an ongoing encounter. The incident comes a day after terrorists attacked an Army camp in Uri on Sunday night. However, a major ‘terror plot’ was averted after the security personnel of the Army Artillery unit at Rajarwani detected some suspicious movement around the camp and opened fire. On February 10, five terrorists were killed in an encounter with security forces in Kulgam. They were identified as Waseem Ahmad Rather, Aqib Nazir Mir, Parvaiz Ahmad Bhat, Idrees Ahmad Bhat, and Zahid Ahmad Parray. As per police records, it was a combined group of Hizbul and LeT. Police had found incriminating material such as arms and ammunition at the site of encounter. The bodies were handed over to the families of the deceased.